Note: This piece was most recently updated on 9/17/2018 to reflect current pricing and links. Okay so that’s two words, but having great funding resources at your disposal is one of the best ways to jumpstart your grassroot charity or ensure a steady stream of revenue for your large nonprofit. What do I mean by funding resources? They’re materials and websites that can help you win grants! Grantseeking and prospecting funds is part and parcel of being in the nonprofit sector, so let us help you do it well. Your nonprofit is likely already using a funding resource, such as GrantStation, Grant Connect or another online searchable grant database. Or perhaps you’re using your own pro-researching skills on Google to find grantmakers. Whatever the case may be, it’s good practice to re-assess your options when it comes to selecting funding resources to ensure your grant applications are based on the most accurate information. How many funders are in their database? The total number of private foundations, government programs and corporate grants listed in their database. These may include active funders (open to accepting grant applications), unknown (not sure if the funder is open for applications) and inactive (funder is no longer accepting applications at this time). How accurate are the funder profiles? As most of these databases gather their information from the same sources (CRA Registered Charity Information Returns, etc. ), this criteria is based on how often they update their funder profiles. Funders change their contact information, granting criteria, application procedures and deadlines from time to time, so it’s very important to have these funder profiles updated frequently! Having access to additional fundraising/grantseeking resources is a definite bonus, as these resources can help you refine your grantseeking skills or help you learn more about the sector (ie., insider tips from grantmakers). Your fundraising staff consists of you. Part-time. The funding resources are GrantStation, Grant Connect, Ajah Fundtracker, FoundationSearch and BIG Online (click on the links to jump to that section!). GrantStation features over 6,000 U.S funders and International grantmakers (great for organizations with international presence), and 1,000 Canadian grantmakers. All funders are active, so you as a member do not have to filter through inactive profiles. Funders are searchable by geographic scope, areas of interest, type of support and keywords. Pretty accurate based on the “last updated” date on funder profiles I’ve seen. All of their funders are actively accepting proposals and profiles are updated on a regular basis (within a few months). GrantStation’s funder profile shows contact information, funder website, geographic scope, financial data, eligibility requirements, application procedures, areas of interest and when the profile was last updated. To see an example of a funder profile, click on the above image. GrantStation offers research tips, proposal building tutorials, webinars, and a number of “How to” services including: list of questions to ask grantmakers, how to write a grant, tips for success and how to build a grant seekers calendar. With Grant Connect’s basic subscription plan, you have access to over 3,000 Canadian grant maker profiles. If you’re on their premium plan, you have their entire database -- over 10,000 funder profiles. But keep in mind that both subscription plans include grant makers that are active, unknown to accepting requests and inactive. Funders are searchable by funding interest, granting region, category, funder location, language of correspondence, whether or not they’re open to funding requests, application deadlines, average gift sizes, types of support and whether the funders’ are new or not. Somewhat accurate based on the “last updated” date on funder profiles and my own experience. Because of the vast number of funders, I’ve seen profiles that are very accurate (updated within a couple of months) and profiles that are not-so accurate (haven’t been updated in years). Grant Connect’s funder profiles shows whether or not the funder is open to requests, funding interests, brief funder description, publications and media, application procedure, financial data, contact information and when the funder profile was last updated. To view an example of a funder profile, click on the above image. A really neat feature of Grant Connect is their “My Pipeline” tool that can help you organize and track your prospect research. Similar to your donor management software, you can mark funders through the solicitation cycle (identified, qualified, cultivation, etc. ), add notes and save attachments directly to your Grant Connect account. The pitfall, however, is it doesn’t sync with your donor management software so you may want to consider how you want to track your prospects before using this tool. Grant Connect also boasts the vibrant Imagine Canada fundraising community, so you’ll have access to fundraising blogs, articles, webinars, tips on grant writing, weekly funder alerts -- the works. You have access to over 11,000 Canadian grant maker profiles, including 5,000 private family foundations, 1,100 Canadian corporations (with over 100,000 corporate gifts listed in the database), and over 800 government programs. Funders are searchable by funder type (foundation, government programs or corporations), activities to be funded and geographical scope. Ajah Fundtracker updates their funder profiles daily, so all information is consistently accurate. 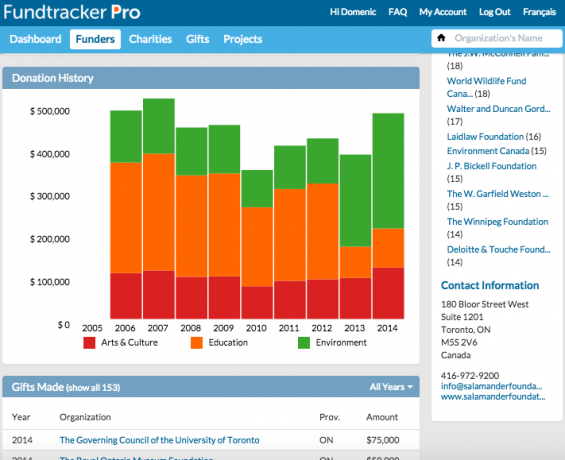 Ajah Fundtracker’s funder profiles shows a financial overview, description of the funder, contact information, application deadlines, history of donations, a list of previous grant recipients and board members. As a member, you have access to a fairly simple dashboard feature, helping you keep track of fund prospects and their application deadlines. Although this can be useful, it’s not synced with your donor management software so you’ll need to consider how your nonprofit would like to track prospects before utilizing this tool. Additionally, an Ajah Fundtracker membership gives access to 5 users, gives full training and support, and is available in French. With Ajah Fundtracker, funders can be searched by type (foundation, government programs or corporations), the activities/mission being funded, target demographic, and geographic scope. Ajah also allows members to search by grant recipients, aka your fellow charities and nonprofits. 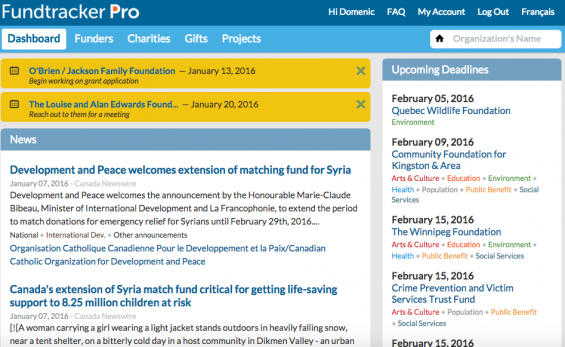 This way, you can search for like-minded charities and see what kind of grants they received (ie., private grants, government programs, corporate grants, etc.). Funders that supports another organization similar to yours is likely to support your cause as well. 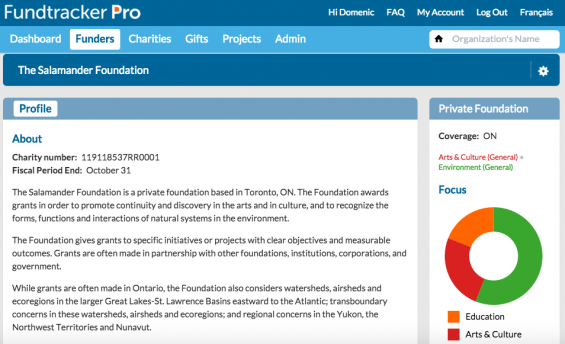 Funder profiles show a financial overview of the funder, a description, contact information, application deadlines, history of donations, a gift map, and a list of board members. As for fundraising/grant seeking resources, Ajah publishes blogs on upcoming funding opportunities, news from the nonprofit sector and a few tips in fundraising (ie., how to write a compelling story). Annual Subscription: in the $3,500 range, per database. However they have year-end specials where you can access both databases for the price of one. Please contact FoundationSearch to request the full details on the subscprition prices. *I’ve grouped these databases together as their information and features are more or less the same; the main difference is that they focus on different types of funders. FoundationSearch profiles over 10,000 Canadian foundations and BIG Online profiles over 800 Canadian corporate profiles. They also only profile grantmakers that award above $4,000 (may include active and inactive funders). Funders are searchable by foundation name, directors, giving interests, types of support, national or international funding, new foundation status, financial value, grant recipients, and donor and historical giving trends. I’m not entirely sure as FoundationSearch and BIG Online do not state how often they update their funder profiles. FoundationSearch and BIG Online’s funder profiles show granting year, granting category, grant sizes, new foundation status, asset and income ranges, geographic scope, types of support, application procedures, deadlines and contact information. Metasoft is an approved education provider for Certified Fundraising Executive (CFRE) and offers a suite of online fundraising courses (webinars, modules and lessons). However, depending on your subscription, these continuing education courses may or may not be included in your plan. If they are not included, you will need to pay additional enrollment fees. Metasoft also offers guides to proposal writing and a few proposal samples. BIG Online offers “Director Connections”, a data visualization tool that maps the network of connections between directors and foundations/corporations. Think of this feature as LinkedIn connections visually mapped out for you on one page. On the other hand, FoundationSearch offers ”My Foundation Manager”, a comprehensive prospecting section that allows you to generate and save prospect lists, monitor specific foundations in your project folder and create prospect-activity reports. But I’ll echo the same concern I had with Grant Connect and Ajah Fundtracker -- this section does not sync with your donor management software. Meet with your fundraising colleagues internally to decide how you would like to track prospects before using “My Foundation Manager”. I’ve Chosen a Database -- Now What? Fundraising is often compared to dating and grantseeking is no exception. What you are effectively doing is finding the right match, asking them out, and showing them why they should stick around. Grant makers and funders set guidelines, proposal criteria and application procedures so they can efficiently find their match. Despite this, many nonprofits still use the blanket approach, sending out as many proposals as possible in hopes that one is bound to click. Does this ever work in dating? No, and neither does it work in fundraising. Have fun and good luck, fundraisers!